Two weeks ago I drew attention to a revealing press conference given by IMF First Deputy Managing Director John Lipsky and European Central Bank governing council member Christian Noyer where it seemed a rather different posture was being taken on the Latvian question than that which is being transmitted from Brussels. Then P O’Neill found a message on Twitter which suggested the topic of the Latvian budget had been unexpectedly added to the EcoFin agenda. Today Bloomberg report that Barclays Capitalâ€™s chief economist for emerging Europe Christian Keller thinks that the IMF’s posture of continuing to withhold funds even after the approval of the spending cuts â€œsignaled that the rift between the IMF and EU has widenedâ€ . That is, SeÃ±or Levy-Yayati is an extremely experienced economist, an old Argentina hand, and enjoys some considerable influence over emerging markets issues in Washington. So was the appearance of the article in Voxeu at the end of June totally coincidental? He certainly is experienced enough to know what he is doing in these matters. And was it also a coincidence that only a week later former chief economist at the International Monetary Fund Ken Rogoff – surely another person who knows perfectly well what he is doing – gave an interview where he said that “Latvia should devalue the lats to avoid a worsening of its economic crisis” and that “the IMF made the wrong decision when it allowed Latvia to keep its currency peg”? The IMF cannot say what it really thinks for obvious reasons, but could we construe Levy-Yayati and Rogoff as thinking out loud on the funds behalf? The clash between the two institutions (should such a clash exist) derives from â€œideological differencesâ€ according to Keller. “The IMF is focused on economic questions such as the sustainability of the currency peg, the use of economic stimulus or the idea of fast-track euro adoption……The EUâ€™s main concern is political, such as euro-adoption rules and the implementation of convergence programs”. 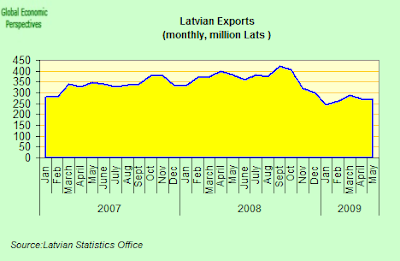 Latvian foreign trade was down again in May, at 618.3 mln lats it was 4.2% (or 27.1 mln lats) lower than it was in April (no green shoot here) and 38.5% (or 387.6 mln lats) down on May last year, according to provisional data of Latvian Statistics Office. May exports were down 30.1% over May 2008, while imports were down an incredible 43.7%. Over the January â€“ May period foreign trade was down by 35.4% on the same period in 2008. Exports were down by 27.7% and imports by 39.9%. Industrial output fell back again in May over April, by 0.4% on a seasonally adjusted basis according to the statistics office. Year on year it was down 19.3%. And domestic demand continues to weaken. Retail sales were down 0.48% in May over April, and 24.14% year on year, according to Eurostat data. 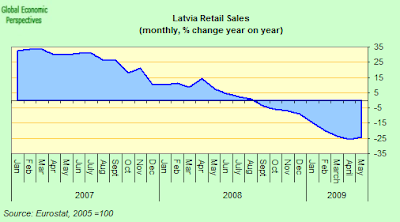 Latviaâ€™s inflation rate fell to 3.4 percent in June, the lowest annual rate since October 2003, from 4.7 percent in May. Prices were down 0.5% on the month, but this is way too slow for the kind of internal devaluation process which is underway. At this rate the loss of GDP will be truly massive before the internal currency correction has taken place. 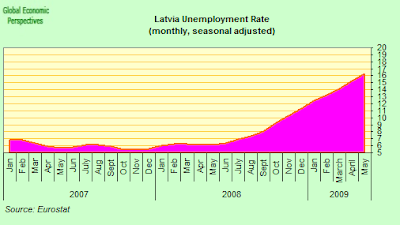 There were 206,000 people unemployed in Latvia in May, or 16.3 percent of the labour force, according to the latest Eurostat data. This is slightly down on earlier data, but since these results are survey based, and such rapid changes make it difficult to apply such methodologies, I don’t think we need suspect any kind of “foul play”. 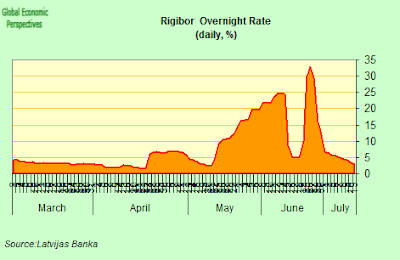 The rise is dramatic enough as it is, as can be seen in the chart below. This makes me wonder were we will be by mid 2010. 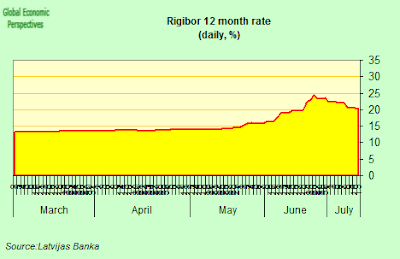 One area where the central bank has had some success has been in getting overnight interbank lending rates down again, and the overnight Rigibor is now back around 3% (13 July), but the 12 month rates are still very high (20.2% 13 July) which does suggest that while market participants are fairly sure the peg is safe in the short term, they are not at all convinced about what is going to happen in the longer term. And in this they seem to be making a valid judgement, since this is the situation at the time of writing. 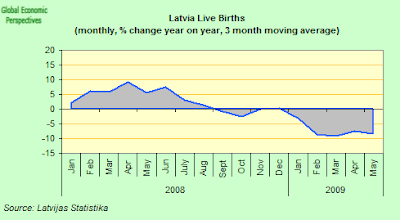 Meatime Latvia’s natality continues to suffer under the weight of the crisis, there were 1750 live births in May, down 15.3% on May 2008. Thus, not only are we playing with the countries short term future here, we are also putting the possibility of having a long term one at risk. When it comes to the short term dynamics of the looming currency crisis in Emerging Europe, one of the Baltic Three, probably Latvia, will most likely be the first to concede its peg, as Eduardo Levy-Yeyati says this is just too painful, and the loss of GDP which is taking place while the politicians are dithering is fearful. 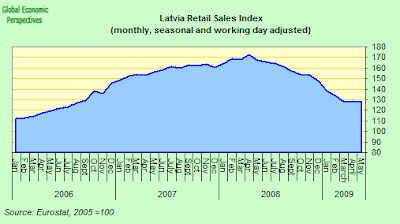 But when Latvia does leave its peg, then others are almost bound to follow. Everything depends on whether the EU Commission and the IMF are proactive or limit themselves to a mere reactive, problem-containment role. If the Latvian currency realignment is done in an organised and systematic fashion, then it may, even at this late date, be a containable process. For this to happen the EU Commission have to stop playing with the politics of the situation, realise that the Maastricht criteria were not written in tablets of stone, and start to formulate a reasonable exit stratgey for all the Eastern members of the EU. They need, that is, to start thinking practical economics, the way the IMF now seem to be doing. The macro economics of this was always clear and straightforward. But if the Latvian situation is simply left to fester, and the country falls into the grip of a growing political anarchy, then containment will be much more difficult, since panic will more than likely set in. A similar situation pertains in Bulgaria (see my latest post on Bulgaria, since the similatities are evident). Absent a Latvian devaluation, it is not unthinkable that the Lev peg may be maintained in Bulgaria for another year or so. But if the Bulgarian authorities do go down this road, then we face the severe risk of a a further raggedy ending, since the problem is not one of sustaining the peg, but of restoring competitiveness and economic growth, and this is much more difficult without a formal devaluation. And if Bulgaria does go hurtling off that cliff on which it is currently perched, then just be damn careful it doesn’t drag half of South Eastern Europe careering after it. The EU Commission need to begin to resolve this mess, and the need to begin now! The private sector has no confidence in sustainability of Latvia’s “Experimentum in corpore vili”. On the other hand, contagion danger has increased, not decreased. 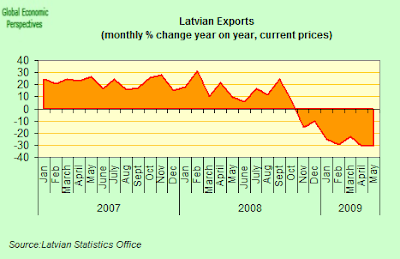 Estonia is also teetering on the brink due to enormous fall in exports. If Baltics will devalue, Poland will have to devalue repeatedly because of Eastern markets. Interestingly, the promises of the bright future in Latvia are moving away with light speed. Now the promise of first green shots for Latvia is shifted for 2013. Which idiot is really interested, what will happen in 2013? The people that have predicted or advised the baltic devaluations are surely competent economic or financial analyists, no doubt. Apparently their arguments, from an abstract point of view, make perfectly sense. 1. Argentina is a latin country where people expect the resolution of many economic problems from the state, from the government. The same applies to other latin (and other) West European countries: there the people would hit the streets in protest expecting the politicians to sort out the mess whatever it takes. 2. The economic situation in the baltics is hard. But is it really hard? What means hard to us and them? 15-20 years ago the economic situation was harder, much harder, and people remember that. 3. Baltic people still remember the devaluation of the soviet ruble that happened in the early 90s and all their savings that dissolved. They know that in the case of a devaluation they will get poorer, and that they will immediately feel that, since their countries are small. 4. In the Baltics (I am refering to Lithuania in particular, but I assume that the situation in Latvia and Estonia is pretty similar) there is no political opposition as in western europe: no trade unions, no strikes, no public protests, no interest in politics, no big differences between parties in parliament. Thus governments can impose bitter economic recipes and still keep governing the country. If France, Italy or Spain would dare to cut salaries by 10% there would surely be a general strike until the government resigns. Not in the Baltics. 5. Baltic economies are very flexible: the public spending ratio of the GDP is low, the labor market is hire and fire, rents in the last two years have become 40% cheaper and employers can easily impose wage cuts: all things impossible in Western Europe or Argentina. ad 2) 15-20 years ago there were substantial reserves accumulated during best times of the Soviet period, the education and health systems were working much more perfectly as in comparable Western economies. None of that is true today. 3) Devaluation of Soviet rouble (then called price liberalisation) caused modest inflation, comparable with Italian inflation during best times for Italy. Extreme devaluation was the case with Russian rouble, and people in Russia seem to be ok with that. 4) The things described are somewhere attributable to patience credit built during nationalistic independence periode 1990-2002. 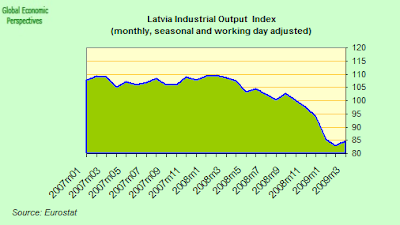 At least in Latvia this credit is exhausted, there were already riots in January. Next ones will come soon. 5) The labour of slaves is not productive. Generally, the utmost problem in case of Latvia, but rapidly spreading to other similar countries, is the fact that most economic actors view the present Internal devaluation problem as unsustainable, and the loss of credibility is even accelerated by present measures. Last week there was the information that Swedish private banks retract their loans to Baltic subsidiaries; today Euler-Hermes announced cancellation of all contracts related to Latvia. The most interesting question is – how long will the EU deliver the life support for Latvia? However! – the EU has very little manoeuvrability under present circumstances. The point of my post is that the people who predict the inevitability of the devaluation do it assuming that it is so, as past experiences from other countries have proved them that in those cases devaluation proved to be inevitable. There are good reasons to devalue and good reasons not to do it: it is a purely political decisions. 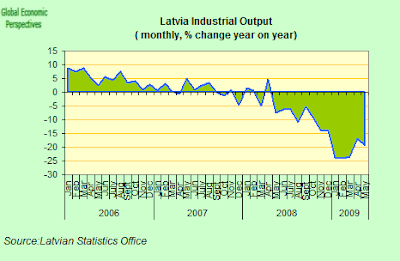 I am convinced that Latvia will not devalue unless the government really runs out of money. There are nations that consider their currency a priority and countries for which it is a secondarity. Baltic nations believe in a strong stable currency, while Russia, as you said, has made different choices. Same in Western Europe: germanic countries believe in a strong currency, while latin countries are less keen to adapt themselves to that. If you have a gross salary, say, of 1500 EUR, and if the Lat is to devalue, say, of 33%, nothing changes if the devaluation happens or if instead the “internal devaluation” happens instead: at the end you salary will be 1000 EUR. Regarding painfulness – the majority of the Balts lived on a monthly salary of 80-100 USD just 20 years ago. Political “pains” were there as well. It may appeear that we grew accustomed to Western spending tempo, but for the most part, it is not true. Most still remember what “too painful” means. At least in LT, Government’s social spending cuts, including pension and public service salary cuts are met by public approval. I would think, most of Western European unions, not to speak about Argentinians, would have already gone berserk. Another point regarding devaluation, which I have not seen addressed here, is the significance of imports. If a country imports nearly all of resources, including energy, doesn’t it reduce the attractiveness of devaluation? 3) The dollar rate in Soviet times was fixed at 0.68 RUB. Several years later, before Lithuania started replacing the rouble with vouchers, the rate was 25-30 rouble per USD. Modest, heh. 0.68 RUB. was the official rate. Unofficial rate was different and is the rate that is important for the public. Advantages of devaluation is that debt and rent also devalue. That doesn’t happen with an internal devaluation. My expectation is that not much will go down in price with a devaluation but cash savings will stay intact. With an external devaluation most expenditure will go down except imports and internationally priced good (commodities mainly). Savings will go down in value but remittance will go up. Problem with a devaluation is the future but that is not a big problem if is accomplished with a change to the Euro (or the Swedish krone). Euro entry is i think politically unlikely after a devaluation but a monetary union with Sweden with its (dead otherwise) banks is a possibility. They just have to spin it right. A couple of comments: It was possible to live on 80-100 USD per month in the mid 1990’s, but that is no longer the case today. They way prices have inflated since then, you could not pay your heating and electricity bills with that sort of money today. I think many economists believe that the pegs can be maintained – but at what cost? A prolonged era of depression where the Baltic States underperform their EU peers? Unfortunately, at the moment maintaining the pegs is much more destructive in the long term than losing them. Unfortunately, most of the main players in this drama have other interests. I understand that while some Swedes are saying that the loan losses will be the same either way – they believe that Swedish interests will be better off (i.e. lower loan losses in the Baltic States) if the peg is maintained. The big EU countries are focused on their own issues and would prefer to maintain the peg and avoid an immediate crisis even if this means substantially reduced future prospects for the Baltic States. The Baltic politicians want to enjoy the Brussels gravy train and join all of the right clubs such as the Euro even if it means putting their populations through undo pain and destroying part of their economies. Ulitmately, the EU, the Swedes, and the Baltic Governments need to decide who will pay for the Swedish bank debt, and devaluation will certainly force all of the parties to address the situation proactively rather than “dithering” in the hopes of a miracle turnaround. Yep, but this seriously risks buying short term peace at the price of risking long run serious problems. I mean if this peg ends in a messy way, or the process begins down south as I mention in my Bulgaria post, then a small problem can quickly become a very big one. This, I suggest, is what the IMF is trying to get across to the EU leaders right now. A prolonged Baltic depression has as advantage cheap labour in the Euro countries. Plus a more defensible border with Russia. 20 years ago it was possible to live with 80-100 USD per month in CEE because costs of living were approx. 30 USD per month. This argument of 80-100 USD is totally awkward. In year 1900 a lot of families could live with 5 USD. If the internal devaluation is followed, there will happen extreme accumulation of debt. Because laws are manipulated in the way that people can not get out of their debt obligations even after they defaulted on their debt for short times. Tax income of the government will decrease extremely, as debt payments will swallow more and more of the personal income. One step that is necessary – mandatory conversion of FEX debt into local currency debt. And a devaluation afterwards. The fate of banks is not so important, they are anyway evacuating everything and do not distribute loans anymore. There’s no public information about what they are. But our political elite looks deeply shocked. Thanks for this LA. I am just posting on it. Why haven’t you joined my Facebook, this is where all this is being discused? Even a first year economics student knows about optimal currency areas. Latvia, and most of the other aspiring members, does not come close to satisfying the requirements regarding convergence of their economy and capital and labour mobility for membership of the Euro; neither do a lot of the existing members. The straitjacket imposed by the Euro will become increasingly constricting and I expect at least one of the existing members to drop out at some stage. When will politicians accept that you cannot legislate economic behaviour? labour mobility for Latvia traditionally is very high, much higher as in parochial Western European societies. You misunderstood me, I am referring to labour mobility between Latvia and the Euro Zone not within Latvia. yes, I mean that. The mobility factor is about 20% for Latvia, mainly Latvians working in the EU, but also EU personnell in Latvia. Unfortunately with the advent of crisis it becomes unidirectional. Also historically, during Soviet period ca 40% of workforce was based on migration. However, I can hardly see a big beneficial role of labour migration for crisis control. Ireland has a high migration factor and is located in EUR zone, at the same time it is an economy most hit by the recession.